The rgl package has been used to produce rich, interactive 3D graphics within R using the OpenGL framework for some time. The rgl authors also added the ability to export to WebGL, allowing R authors to produce interactive 3D graphics that were accessible from within any modern web browser. Alternatively, you can download the bleeding-edge version of the code, view more details about the implementation, or track the development of the package on our GitHub repository. Please use GitHub to notify us of any issues or feature requests you may come across, as well. 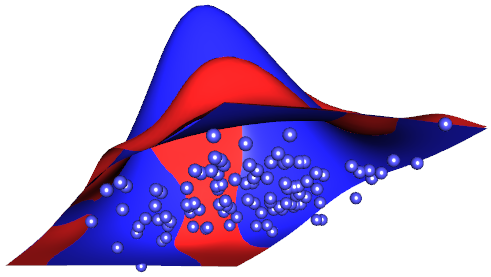 Below is a sample of the kinds of graphics that can be produced using shinyRGL by writing only R code. Be sure to pan the scene by clicking and dragging, zoom using the scroll wheel, and even change the point of view by clicking and dragging with the right mouse button.